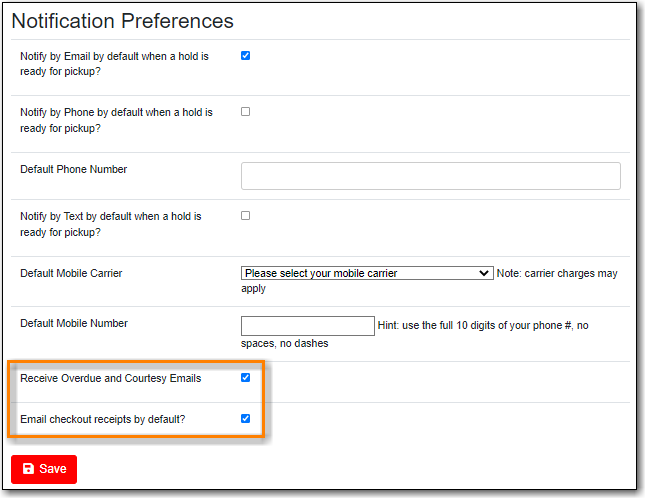 Select the Account Preferences tab at the top of the My Account area to access your preferences. 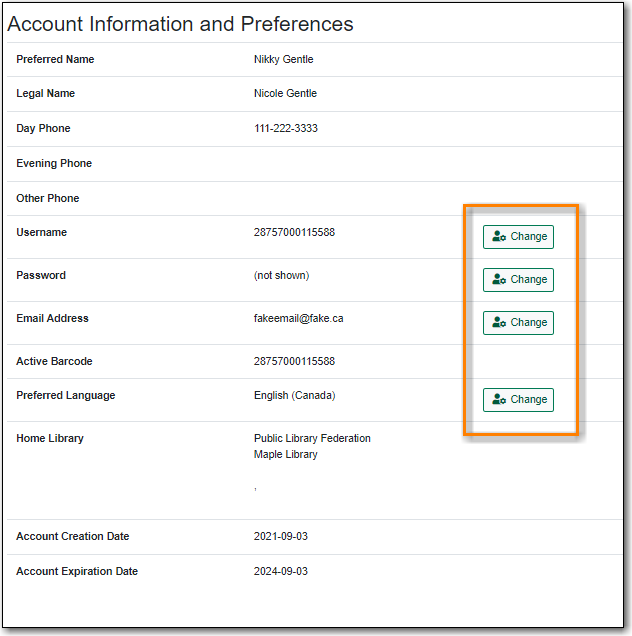 You can change the username and password that you use to log in to your library account as well as the email address the library uses to contact you in the Personal Information tab by clicking the Change link next to the item. Depending on your library's policy, you may request a change to your address by submitting a new address in your account. Library staff will verify it and update your account. If you need to make a change to other information, such as your phone number, please see the library staff. The Notification Preferences tab is where you set your preferences for holds notification. You can choose to be contacted by email, phone or text message. This is also where you can opt-out of receiving courtesy and overdue email notices using the Receive Overdue and Courtesy Emails setting. Un-checking this box means your library will not send you any emails for items coming due or overdue. You are still responsible for returning items on time and paying any applicable fines. link. If you wish to receive checkout receipts via email by default you can check the Email checkout receipts by default checkbox. 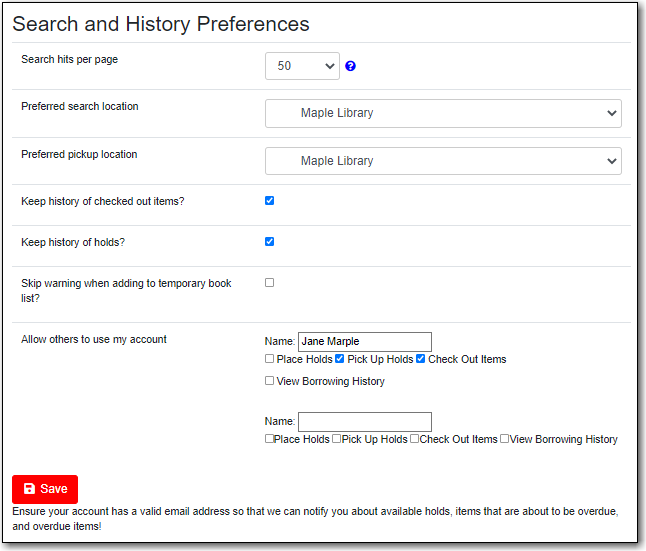 The Search and History Preferences tab allows you to configure settings around search results, history, and allowing others access to your account. You can select how many search results are displayed per page on your catalogue searches as well as your preferred search location if your library is a multi-branch system or part of a larger borrowing zone. You can also set your preferred pick up location if your library is a multi branch system or part of a larger borrowing zone. Check Out and Hold history can be enabled on this screen. The check out and holds history is not retroactive; it takes effect once you choose to retain your history. You may also choose to disable a warning about adding items to a temporary list. You can specify who, if anyone, you want to access to your account and what access you wish them to have. This is useful if you'd like someone else to be able to pick up your holds for you. The My Lists Preferences tab allows you to set how many lists you'd like to display per page and how many item should be displayed per page in your lists.